George W. McLaurin provided the Oklahoma civil rights case that damaged the 1896 Plessy v. Ferguson “separate but equal” legal position beyond repair. He held a master’s degree from the University of Kansas and taught at the all-black Langston University until 1948. NAACP attorney Thurgood Marshall, Oklahoma attorney Amos T. Hall, and Black Dispatch newspaper editor Roscoe Dunjee supported McLaurin’s efforts, along with five other African American students, to pursue advanced professional degrees at the University of Oklahoma. McLaurin’s cases worked in conjunction with Ada Lois Sipuel Fisher’s suit to open higher education to African Americans in Oklahoma, and lay the foundation for Brown v. Board of Education. In 1948 the sixty-one year old McLaurin applied to the University of Oklahoma College of Education to pursue a doctorate in school administration. Faced with the challenge of providing educational programs for McLaurin and five others enrolling in diverse areas, a statewide panel of academic deans recommended the admission of black students to graduate programs. The Federal District Court ordered O.U. to admit McLaurin, however he was segregated into separate classroom, library, cafeteria, and restroom areas. Oklahoma amended its segregation law to allow other black students to attend under similar circumstances. Marshall argued in McLaurin v. Oklahoma State Regents for Higher Education that this humiliating treatment violated the Fourteenth Amendment. 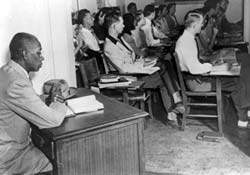 In 1950 the Supreme Court ruled that the universities must provide the same treatment for African American students as they do for other races.